It will expand exponentially over the course of the year, and there will be a marathon or two there. I am definitely looking at BERLIN, and would like to do a sunny one too. I will run the ROYAL PARKS HALF again, BRITISH 10K, LONDON 10K and maybe SHEFFIELD 10K. I will NOT be running the TEACH FIRST 10K…. Of course you all know the story by now. We ran the Teach First 10K back in September. This was a nice race on paper, taking in 4 bridges and running along both sides of the Thames. We all PB’d and everyone tweeted and crowed about their new record. 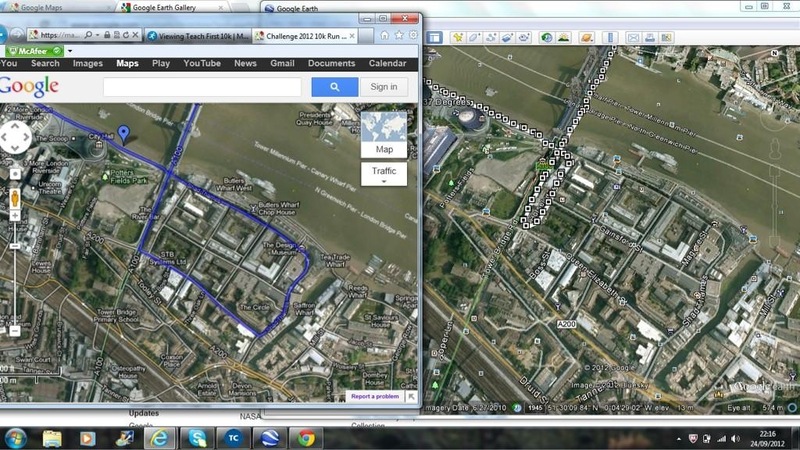 Then we uploaded our stats and found that the course was between 9.4K and 9.6K using GARMIN and NIKE GPS. @SmoothnPedally overlayed the map and showed that the difference was a staggering 6 blocks and it was strange as they block was weird to me as it was right off Tower Bridge, a girl was marshalling the first corner without an arrow on the lamp post and pointed us left, two blocks down a couple of marshals were looking left too, expecting us to come that way, before seeing us coming straight ahead. They were all in fact looking where we SHOULD have been coming from. Simon’s Map: Left in Blue is advertised route, right in dots is the actual GARMIN GPS route we ran. Spot the Difference? Anyway, long story short, we email Teach First who denied all knowledge (odd for a teaching charity) and said to take it up with 209 Events, the race organisers. I mailed 209 Events who said they would remeasure the course. Remeasure the course? If they remeasured the advertised course it would be 10K, it was always 10K, but WE DIDN’T RUN THE ADVERTISED COURSE!!! I told them this, included Simon’s map and left it to focus on the next race. Anyway, yesterday, after a few beers, I decided to reopen that particular can of worms after reading several people had posted about their amazing PRs. It’s not that I want to burst their bubble, but if you get a PR at 10K that is so much better than you could ever, or will ever do, isn’t that more damaging. You will never beat that amazing time you got at the Teach First 10K back in September 2012, and will feel low each time you don’t. GARMINs showed between 9.4 and 9.6K. Including GARMIN + Foot Pod that would cater for the steps. The times we got were wildly fast. I beat my first 10K race time by 11 minutes! Without pushing myself. The route from the GPS overlayed on the advertised route was the same OTHER than those 6 blocks we lost. So, suffice to say, neither the charity or the race organiser will admit fault where there clearly is fault. I shall not run this race next year on principle, and will cite this reason when asked. 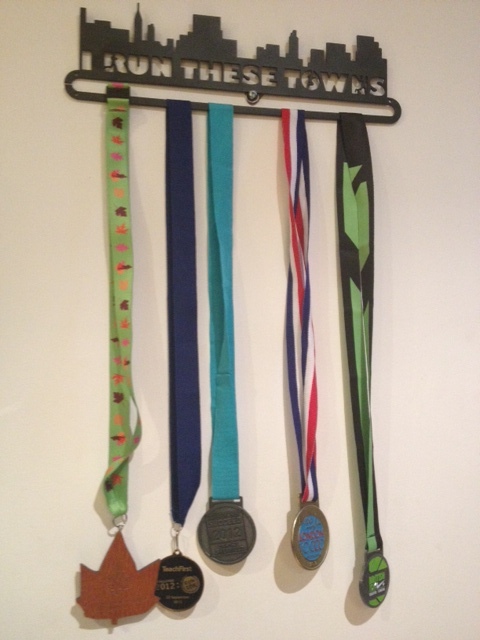 But, ending on a positive note, the medal rack for 2012 is starting to look less sparse. Needs a little diversity, no? Like the giant dinner plate US medals, the wonderful Disney bling, or the uniquely shaped marathon medals you get in the big cities.